It all started with corn sprouts. I was in the new Foodland Farms, the "gourmet market" off-shoot of a local grocery store chain that opened about 2 miles from my house. The store is a good source of hard to find ingredients, cheeses and has a fairly large selection of locally grown fruits and vegetables. 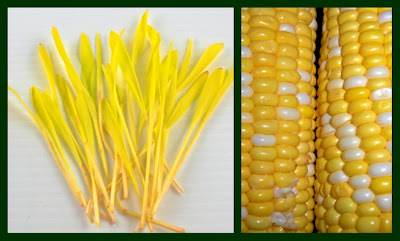 In the veggie section I picked up some locally grown sweet corn and a package of local corn sprouts. Although I have tried corn sprouts as a garnish before at restaurants, I had always concentrated on the dish underneath rather than the sprouts themselves, which are surprisingly sweet and good. I began throwing them in salads and such, and I decided to use them to garnish some fresh sweet corn chowder. 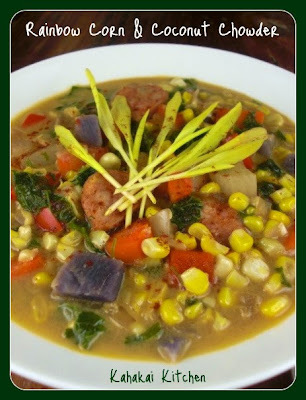 I wanted to make it a healthier, vegetable-based chowder and since my corn sprouts and sweet corn were locally grown, I decided that all the other vegetables in it would be too. So with the exception of the broth, coconut milk, paprika, salt and pepper--the rest of this soup is local, from the store, farmers market or my CSA box, and the local ingredients are highlighted in green below. I used coconut milk to thicken it slightly, wanting to keep it light and dairy-free. 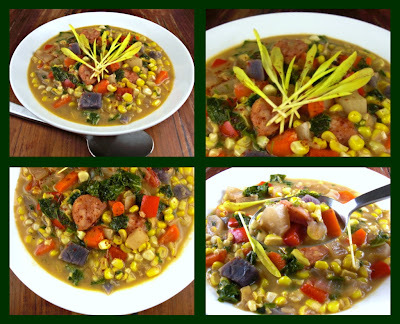 It's also important to "eat the rainbow" getting all sort of colors and therefore all kinds of nutrients into your diet, so Rainbow Corn & Coconut Chowder was born. Heat oil over medium heat in a large pot or Dutch oven. Add onions, carrots, and red pepper and cook until vegetables start to soften, about 5 minutes. Add sweet potato, daikon, stock-water combo and bay leaf and bring to a boil. Reduce heat and simmer until vegetables are tender (about 15 minutes). Add coconut milk, corn kernels, kale and parsley and simmer another 10 minutes until kale is wilted. Add salt and pepper to taste, smoked paprika and cooked chicken sausage if using. Serve in shallow bowls garnished with corn sprouts (or other sprouts) and paprika. Notes/Results: Great--dense but not heavy, fresh, healthy and good, the chowder was what I was aiming for. Because I used some sweeter vegetables, in my mind it called out for more savory so I added some locally-made chicken sausage from the farmers market, and the the sausage and the smoked paprika were a nice contrast to the sweetness. Of course if you want to keep it vegan, I wold just add a bit more smoked paprika. I would make this again, playing around with the veggies, using what is fresh and local. Lets see who we have in the Souper Sunday kitchen this week. Kim from Stirring the Pot found ananswer to her bean cravings this week and says, "This Tuscan White Bean and Garlic Soup is really creamy and flavorful and costs next to nothing to make, which is a plus. The recipe and the picture caught my eye while reading through a copy of Giada's Kitchen and I was very happy to find that I had all the ingredients to make this soup. I am a big sucker for recipes made with pantry/staple ingredients." 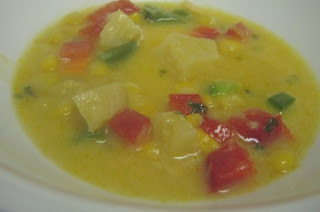 Chaya from Chaya's Comfy Cook Blog morphed two soups into her Corn Soup with Potatoes. She says, "This recipe originally was made with lard and ham steak but being kosher, I eliminated these from the recipe. To give the recipe some additional flavor, lacking the “treif” ingredients, I used a frozen container of Tyler Florence's corn soup. This photo is a small amount of soup to show you all the delicious vegetables in it." 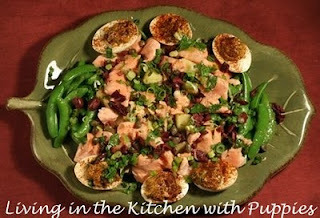 Natashya from Living in the Kitchen with Puppies tried a creative take on a classic, Poached Salmon Salad with Warm Potatoes, Red Chile-Spiked Deviled Eggs, and Smoked Chile Dressing. She says, "That Bobby, he knows big flavour. This is Bobby Flay's spin on a classic niçoise salad, adding his signature South Western flavours for a delicious and reasonably healthy dinner salad. Ever since I made Julia Child's version of this composed salad in the summer I have been looking forward to trying it again, Bobby doesn't disappoint! Serve this with a crisp white wine and a loaf of crackly-crusted French bread for a delicious dinner." 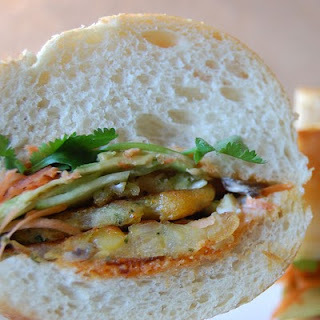 Here with a delectable fusion Veggie Sandwich is Christine from Kits Chow who says, "I made Korean mung bean pancakes, Bindae duk and it occurred to me that they would make a good patty for a veggie burger. I was right. This is a very good veggie burger and I recommend it for a meatless, Lenten meal. My sandwich is inspired by the Vietnamese sub, Bánh Mì and the meat portion is based on the Korean mung bean pancake, Bindae duk, except that I used split peas. How is this for Asian fusion!" A few, but mighty dishes today! Thanks to Kim, Chaya, Natashya and Christine. If you have a soup. salad, or sandwich to share, click on the Souper Sundays logo on the side bar for all of the details. Uh-oh..two cocktails in two weeks as my "Simple Saturday Sippers"--maybe I need an intervention?! It's really that I just couldn't resist making these Hot Rum-and-Pineapple Toddies after seeing them in this month's Everyday With Rachel Ray magazine. Confession time--I am not a big Rachel Ray fan, frankly she drives me a bit crazy, but I had picked up the magazine while waiting in line and found a couple of recipes in it that looked intriguing. This drink was created by Scott Beattie, mixologist and author of "Artisanal Cocktails". He tops his toddies with maple-whipped cream, but since I am not doing dairy I left it off (although I am sure it was quite delicious that way! ), and instead garnished with small skewers of grilled pineapple chunks. 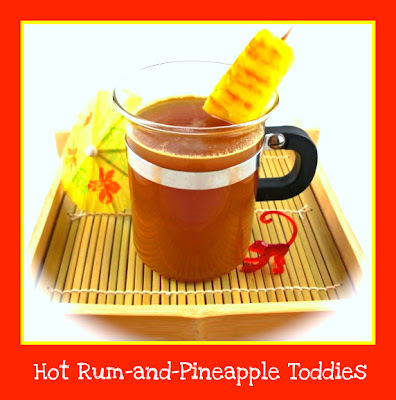 It's a great cocktail for a cold night when you need a warm drink with a little island flavor. In a small saucepan, bring the pineapple juice , 2 tablespoons maple syrup, the lemon juice and cinnamon stick to a boil. Lower the heat and simmer for 5 minutes; remove from the heat. Meanwhile in a medium bowl, beat the cream with the remaining 1 tablespoon maple syrup until soft peaks form. Divide the pineapple-maple mixture among 4 small teacups or mugs. Discard the cinnamon stick. Add 1/4 cup rum to each cup; top with the maple whipped cream. Notes/Results: Oh yeah...that warms the throat and right on down! The pineapple juice (I used fresh,100% juice) and the maple syrup make it rich and sweet and are perfect with the dark rum. It's an easy drink to make, is quite delicious and packs a punch--probably the reason for the small serving sizes. I would make this again. Once again I am making good use of my newest issue of Clean Eating magazine, with tons of recipes tagged to make. 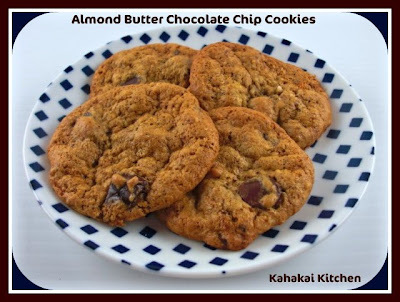 These Almond Butter Chocolate Chip Cookies stood out because I love almond butter and because they are gluten-free, low-sugar, and dairy-free (that last one is really dependent on the chocolate you use). For the sweetener these cookies use Sucanat, which is a minimally processed derivative from sugar cane. Sucanat is somewhat grainier than sugar and has a slightly molasses sort of taste--so it works well in cookies and muffins. Because it is minimally processed, it retains its natural iron, calcium and other nutrients that help balance rather than spike blood sugar. (I have used it before--like in these Fudgy Chocolate Cookies here). You can find it at natural foods stores or I have even seen it in grocery stores with a well-stocked natural foods section. If you can't find Sucanat you could use a raw sugar or brown sugar instead. After a long day of work and studying, some quick, fairly healthy cookies seemed like the perfect little snack to try. Clean Eating says, "Six ingredients, two steps and 20 minutes is all you'll need to whip together two dozen of our no-flour, dairy-free, low-sugar cookies." Cleaning Eating Nutritional Bonus: "While dark chocolate contains potent antioxidants, think twice before enjoying it with milk. Researchers have found that the bittersweet treat's free-radical fighters may bind with the protein in milk, interfering with antioxidant absorption and possibly negating any associated health benefits." Notes/Results: Pretty good little cookies. They go together quickly and bake up well--although you do need to watch them. I pulled mine out at 10 minutes and felt like they were just a little brown for me. The cookies do stay really soft and are a little fragile. I cut the Sucanat down to 1/2 cup and they were plenty sweet, so I might reduce it even more next time. I used a combination of the last bit of a bag of vegan chocolate chips and a bit of a dairy-free dark chocolate bar to make up the 3-ounces the recipe called for. I thought it might be fun to try some oats in part of them so I added about 1/3 cup of rolled oats to the last 1/2 of the recipe. (See the lower right-hand corner shot above). I liked the texture of the oat cookies--didn't necessarily like them better than the plain, but they were good. I think if I added oats again I would put some dried cranberries in too. My only complaint--I am not sure how they got 24 cookies out of "rounded tablespoons" of the dough. I used my tablespoon to measure, my scoops were not very rounded at all and I got 21 cookies--but only after I added the oats. 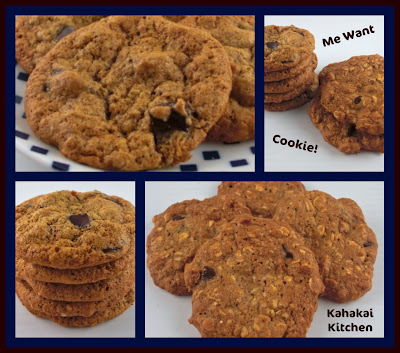 Not the best, most decadent chocolate chip cookie in the world, but for a healthier, gluten-free, dairy-free treat, I would make these again. Do gloomy winter days have you longing for a bit of sunshine? 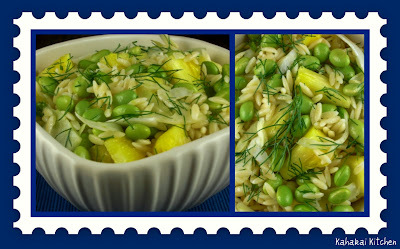 Then this brightly-hued Orzo with Fennel, Edamame, and Pineapple is the side dish for you. The combination may sound a bit strange but trust me it works. To create this recipe I took inspiration from two separate sources. First, a simple salad of fennel and pineapple I got from the deli case of a local store. I thought the combination of the fennel paired with the juicy fresh pineapple really worked. A day later I got the March/April Clean Eating Magazine and there was a recipe for a side dish with orzo, orange and fennel (plus green onion and feta), in a basic vinaigrette that sounded good. I thought that putting some of the main components of each together with a jazzed up dressing of my own would make a healthy, refreshing side dish. Also a side dish that would be perfect for the new monthly blog event Side Dish Showdown created and hosted by my good friend Reeni from Cinnamon Spice & Everything Nice. This month's showdown theme is "Anything Goes" and this dish goes especially well with chicken or fish. Cook orzo according to package directions, drain and place in a large bowl. Add dressing, mix and allow to cool. 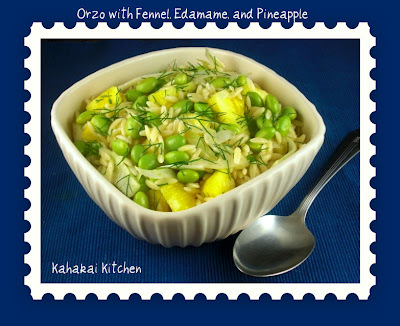 Add sliced fennel, fennel fronds, edamame and pineapple to orzo and toss gently until well mixed. Serve at room temp or chill in fridge. 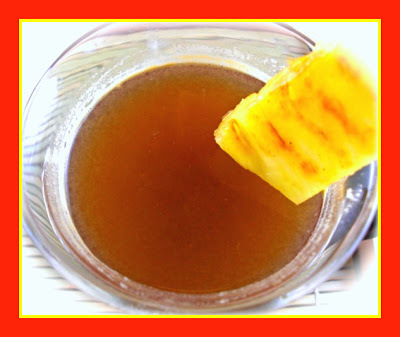 Combine olive oil, vinegar, lemon juice, pineapple juice, Dijon, honey and pepper in a small bowl and whisk to combine. Taste and add sea salt to taste. Notes/Results: Excellent! The flavors and textures go together really well and it is an easy healthy dish that is pretty to look at. Since both fennel and pineapple are perennial, it works well at room temperature and is delicious chilled, this side dish can be made and served year-round. My only "issue" is that I wanted to use my favorite whole wheat orzo in it for the extra fiber, and both places I can usually find it were out of stock, so I was stuck using regular orzo. :-( It was of course still delicious, but I would definitely use the whole grain orzo next time. Since I am being dairy-free, I chose not to put in the feta that the Clean Eating recipe uses but if you want cheese, either feta or a tangy goat cheese would work well in this dish. You could also add other veggies or some herbs too. I liked the additions I made to the dressing--the Dijon, honey, pineapple juice and lemon added a good layer of flavor. With the fiber, vitamin C, potassium and manganese in the fennel, the fiber, protein and other good things in the edamame, and the vitamin C and fiber in the pineapple, (Whoa--whole lotta fiber going on there!) 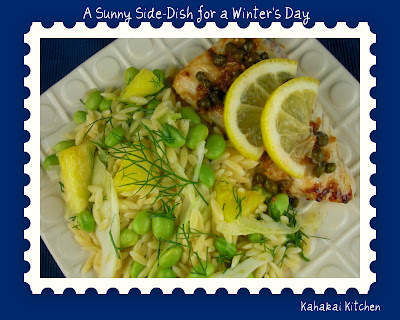 this is a nutritionally packed dish and a keeper recipe for sure! It wouldn't be a side dish without a main dish so I paired the orzo with some Barramundi, prepared picatta-style, with olive oil, garlic, lemon and capers. I have not cooked or even eaten barramundi, (a mild, white fish from the coasts of Australia and Southeast Asia), but I heard about it on Dr. Oz ;-) and wanted to try it. Dr. Oz called it one of his "5 super foods to eat now" and I have a Pavlovian response to the term "super foods"--I get all excited when I hear it and I must try them. (Yes, I know I am a geek...admitting it is the first step). Dr. Oz said that the barramundi is a vegetarian fish, dining on planktan instead of other smaller fish so it has lower levels of mercury and it also has "higher omega-3 levels than salmon." In researching it a bit for this post, it appears that Dr. Oz may have been a little too enthusiastic in his declarations. A few sources I read said it would be more accurate to state that although it is carnivorous by nature, the fish can eat and thrive on a mostly vegetarian diet (sounds like me! ), so depending on how your barramundi is raised (quality farmed barramundi is usually fed a mostly vegetarian diet), that first claim may or may not be completely true. Also it appears that the barramundi has comparable levels of omega-3s to wild salmon, but it does have much higher levels than any other white fish. Super food or not, I was still happy to find it frozen, from a reputable supplier at my local grocery store and give it a try. It is a good, basic mild-tasting white fish and worked well sauteed with the seasonings. I wouldn't seek it out to eat all of the time but it was a nice change. (That was probably WAY more than you ever wanted to know about barramundi--see geek comment above!). A delicious dinner with a showdown-worthy side dish. You can check out this month's Side Dish Showdown entries by going to Reeni's site and following the links (here) and she'll also be doing a round-up at the end of the month. I lied...I said I would have a normal Tuesday "Things I Am Loving This Week" post today but alas, life got the best of me last week and although I had things I loved, I didn't have time to get it all together for a post. I shall strive to get one up next week. 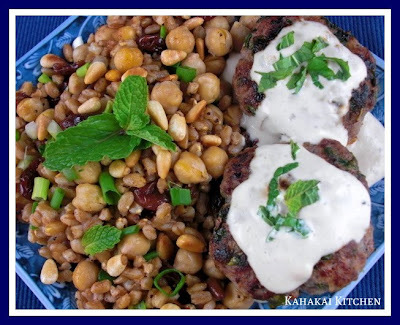 Still, there is a lot to love with my easy and delicious Middle Eastern meal below--a Cherried and Chickpea'd Farro Salad adapted from Nigella for this week's "Great Grains" theme at IHCC. 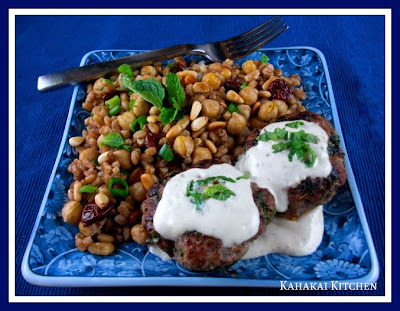 The salad makes a wonderful side dish for some Ground Lamb Patties or "Kefta" from Claudia Roden that are topped with some Tahini Dressing from Jill Dupleix. The entire meal is going to Regional Recipes, a monthly event hosted by one of my very favorite blogging friends, Joanne from Eats Well With Others. Regional Recipes is stopping in the Middle East this month and since it is some of my favorite food to make and eat, (and I love Joanne! ), I had to join in. Two fun events, three recipes from three great cooks--never let it be said that I can't multitask! First up the Cherried and Chickpea'd Farro was meant by Nigella to be couscous, and although couscous, technically a pasta made from semolina or the middlings of durum wheat is great, I decided to go with a greater grain--farro. 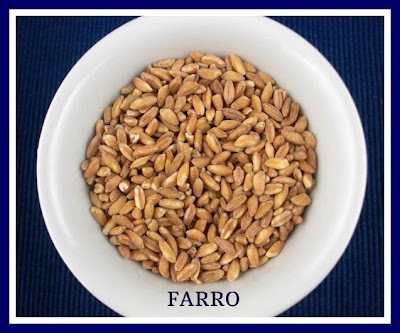 Farro is an ancient grain, a cousin of wheat and closely related to spelt. It is a complex carbohydrate and for roughly the same calories as couscous it has more than twice the fiber and more protein too. Sure, it takes longer to make than couscous, but really no more effort--just a bit of time. If you have not tasted it, it has a great slightly nutty taste and a chewy texture. The recipe can be found in "How to Eat" by Nigella Lawson on page 186. My changes and cooking instructions for the farro are in red below. Nigella says, "Now, normally I hate fruit in savory concoctions, but the sour cherries here really do work. There is an authenticity to the mixture of sweet dried fruit and waxy nut and fragrant buttery grain. But if you don't like the idea of sour cherries, just leave them out. The couscous will taste better if it has been steeped in stock rather than water, but by making stock I don't mean anything more arduous than stirring half a stock cube into boiling water." Pour boiling water into a measuring cup to get 2 cups, add the half boullion cube, crumbled, then pour into a saucepan and bring to the boil again. Add salt to taste. Put the couscous in a bowl and mix in the cherries, cumin, and cinnamon, and then turn into the saucepan of boiling water. Wait until it starts to boil again, put the lid on, and take the pan off the heat. Meanwhile, put a heavy frying pan on the stove and, when it's hot, toast the pine nuts. When they are beginning to turn golden, remove them. Heat the chickpeas with their liquid in a saucepan. 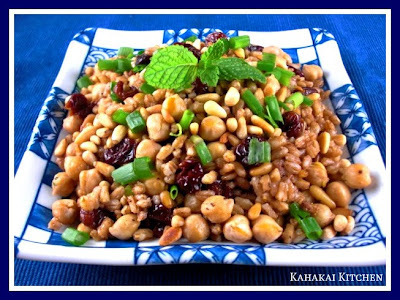 When the couscous (farro) is tender and has absorbed the liquid, about 10 minutes, add the drained warm chickpeas, stir in the butter (olive oil) , then half the pine nuts, and turn out onto a large heated plate and sprinkle with the remaining pine nuts. You will probably have more couscous than you need here, but I feel that making less than this looks so miserable and unwelcoming. Anyway, it tastes good the next day. The best way of reheating it is either by steaming it (a strainer suspended over a saucepan of boiling water will do it) or a quick burst in the microwave. Stir in the scallions and eat hot with the harissa to the side. Notes/Results: Yum! 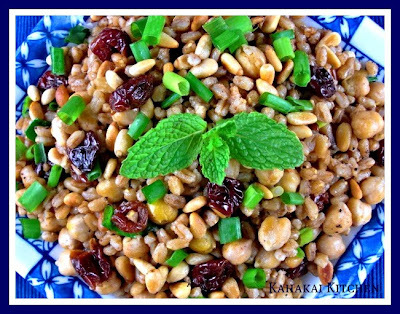 I love the hearty, chewy texture of the farro in this salad/side dish--it really stands up to the chickpeas. The tart cherries and toasted pine nuts both add good texture and flavor to the dish. A great combination of ingredients and a tasty, healthy salad--I would make this again, most likely with the farro. I bought some ground lamb and since I was headed to the Middle East with the side dish, I thought some spiced lamb patties would be a good choice. I pulled out "Arabesque" by Claudia Roden, one of my favorite cookbooks and one that should be in your collection if you want to learn more about Middle Eastern foods, (Actually any Claudia Roden book is a must-have addition to your collection--she is amazing). Although I could have made these more traditional on skewers, I took the easy way out (Claudia says it is fine), and just formed the mixture into small patties, that I cooked on the stove top in a pan lightly brushed with olive oil. I made a half-batch with one pound of the lamb, but doubled the dried spices (I like big flavor). With the half batch, I got six small patties. This recipe can be found in "Arabesque" by Claudia Roden on page 99. Claudia Roden says, "In Morocco, men are masters of the fire, in charge of the brochettes, the small kebabs threaded on little wood or metal skewers, which are traditional street food. 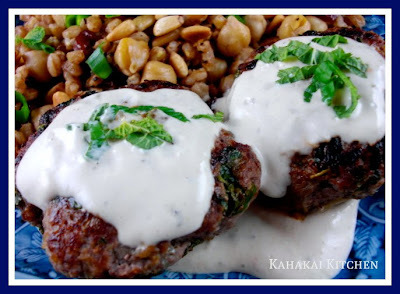 The ground meat kebabs are deliciously aromatic--full of fresh herbs and spices. The meat is usually pressed around skewers and cooked over dying embers, but it is easier simply to pat the meat into sausage or burger shapes and cook them under the broiler or on a griddle. There should be a good amount of fat (it melts away under the fierce heat), enough to keep the meat moist and soft. otherwise work 3 tablespoons extra-virgin olive oil into the paste. Bite-size keftas can be served as appetizers at a party, but en famille burger-size ones, accompanied by a salad, represent a main dish." Put all the ingredients together in a bowl. Mix well and work with your hands into a soft paste. Wash your hands and rub them with oil. Take lumps of paste the size of a tangerine and roll them into sausage shapes about 3/4 inch thick, then press them around flat wooden skewers. Alternatively, shape the meat into burgers. Place the keftas on a heat-proof serving dish or on a piece of foil on a baking tray and cook under the preheated broiler for 10 minutes, turning them over once, until browned on the outside but still pink inside. Serve hot with good bread and a salad of cucumber. tomato and red onion, dressed with lemon juice and olive oil. Notes/Results: Excellent! A nice combination of herbs and spices that give the lamb wonderful flavor. Although I didn't find my lamb to be very fatty, I didn't add any extra oil and they were still juicy and delicious. This is a simple, quick recipe that tastes great and I would make it again. 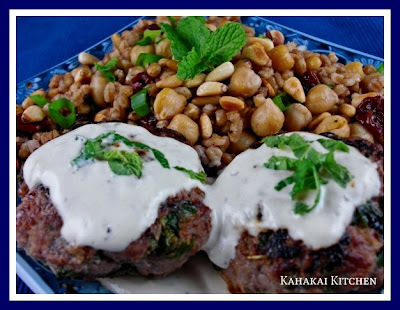 Finally, I was craving some tahini sauce with my kefta so I used a simple recipe from Jill Dupleix that is one of my go-to sauce and salad dressings. (It is excellent on tomatoes--see that post here). In a blender, work 2 crushed garlic cloves with 1 tsp sea salt, 2 Tbsp lemon juice, 3 Tbsp tahini paste, 1/2 tsp ground cumin, and 2 Tbsp water. Add a little extra water until creamy. Notes/Results: Creamy and good. I like the roasted tahini rather than the raw in this recipe, as it has more of a toasted nutty taste and is less bitter. It was great on the lamb patties and it is also wonderful for veggies or as a salad dressing--you can add additional water to get it to the consistency you want it. A delicious Middle Eastern Meal for Regional Recipes and a delicious salad/side dish made up of some "Great Grains" for IHCC. Joanne will be doing the RR round-up at the end of the month and you can see the grain dishes the other IHCC participants made this week by going to the website (here) and following the links to their posts. Cooler weather (OK that just means light blankets and socks here but it is cooler!) always has me craving thick, creamy, comforting soups. 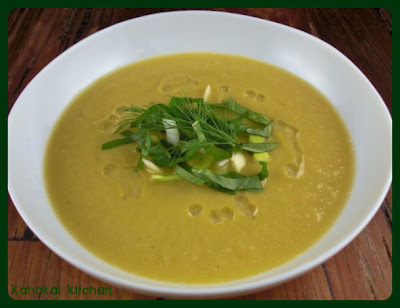 I saw this recipe for Creamy Cauliflower, Fennel, and Leek Soup in Natural Solutions magazine and liked the combination of ingredients; cauliflower, fennel, leek and celery, thickened with almond milk and drizzled with almond oil. 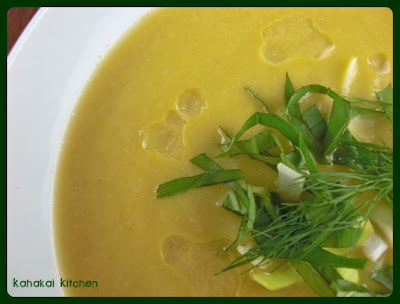 This soup if full of healthy fats (monounsaturated), good for you veggies, and according to the article full of pH-balancing alkaline ingredients. Warm coconut oil in a saucepan over medium-low heat. Add leek, celery, and fennel; cook, stirring occasionally, until softened, 4 to 5 minutes. Add cauliflower and broth. Cover and cook, stirring occasionally until cauliflower is soft, 15 to 20 minutes. Stir in almond milk, and remove from heat. Puree soup in batches in a food processor or blender until creamy and smooth. Stir in 1 tablespoon almond oil. 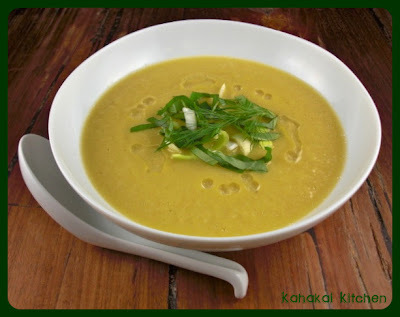 Divide soup among four bowls; drizzle with remaining almond oil. Garnish with basil. Soup can be served hot or chilled. Nutrition Info Per Serving: 203 calories; 12g fat; 3g saturated fat; 0mg cholesterol; 6g protein; 22g carbohydrates; 9g fiber; 265mg sodium. Notes/Results: Creamy and good. It's a subtle soup, rather than a "smack-you-in-the-face" with flavor one, but it works well. It is simple and relatively quick to make (under 40 minutes, all in). The almond milk gives it a nice creamy texture and the drizzled almond oil is a nice touch, although you could substitute with another light or flavored oil. It did need couple of small pinches of sea salt (not in the recipe) to bring out the flavor. I tried it both hot and chilled as the recipe suggested and although it was good cold, I think it's best hot as it brings more of the subtle flavors out. It was great as a light dinner with some toasted whole grain baguette. I would make this again. Such a pleasure to have my friend Laurie from That's Not What The Recipe Says back at Souper Sunday this week. 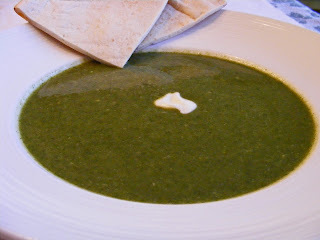 Laurie brought a Creamy Spinach & Broccoli Soup, about which she says, "Some food just does not photograph well and this soup certainly qualifies. No matter what angle I tried, it just looked like a big bowl of green mush. The dollop of plain yogurt didn't improve the photo, but it did add a nice tangy flavor that melded well with the lemon juice I added at the end of the cooking process. But it sure was tasty. I've been trying to eat more veggies, lots more veggies, and soup is my favorite lunch." The lovely Graziana from Erbe in Cucina has a soup she made for her combo Chinese New Year / Valentine's Day dinner, this Chinese Soup with Ginger and Coriander. 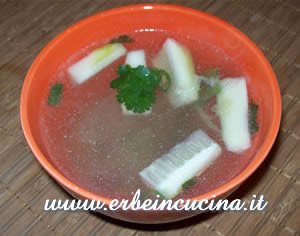 Graziana says that this recipe with Chinese cabbage, diced ham, cucumber and of course the ginger and coriander makes "A warm and tasty soup." It's always fun to see what Graiziana creates with the amazing bounty from her garden! 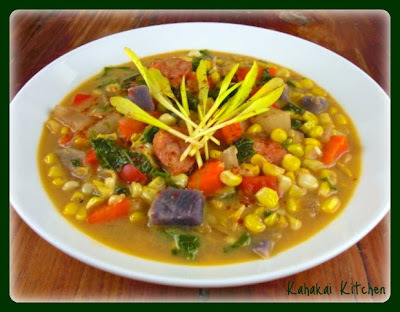 Chaya has a soup to share from each of her two blogs this week. 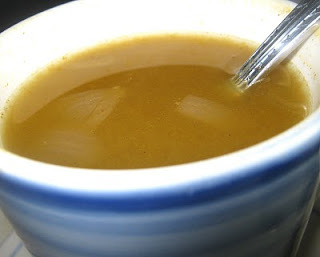 From her Sweet and Savory blog she has a hearty crock pot New England Sweet Potato Soup. Chaya says "This turned out to be the best soup, I have made and I didn't have a clue, it was going to happen." You can find out the story behind the success of her soup and why she says, "I could have finished the pot." by visiting her blog. 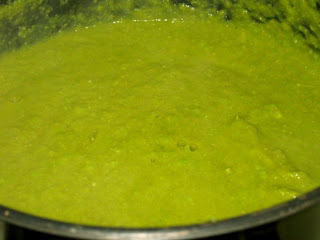 At Chaya's Comfy Cook Blog, she has her version of Nigella Lawson's Green Pea Soup. Chaya says, "I am making an honest effort to feed the family healthier meals. My husband is the happiest, in the winter, with soup, each night. I was concerned that my husband was not going to like the balsamic vinegar in the pea soup and tensely waited to hear if he had something to say. Silence – uh oh – he doesn’t like it. I look over at him. Of course, he is quiet. He is busy enjoying his soup. Then an exclamation. This is good soup!" Donna from My Tasty Treasures is here and has a comforting soup to share. She says, "This Paprika Chicken Stew with Potato Pierogi meal is a Rachael Ray .. original here. Tasty take on a quick version of chicken paprikash. It is different in that is is made in 30 minutes or so, and is served with pierogies. Tastes better as it sits so make stew a day ahead if you can. Tasty, satisfying weeknight meal." 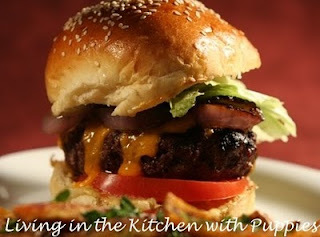 Finally we have one sandwich this week from my best pal Natashya at Living in the Kitchen with Puppies; and what a sammie it is: Bobby Flay's Mesa Grill Burger with Double Cheddar Cheese, Grilled Vidalia Onion, and Horseradish Mustard. Natashya says, "Is that a burger or is that a burger? That ain't no slider, that is a two-handed, unhinge your jaw and only eat in front of people who love you honest-to-goodness hamburger." Another delicious week--thanks to everyone who joined in. If you have a soup, salad or sandwich that you would like to share, just click on the Souper Sundays logo on the side bar for all of the details. 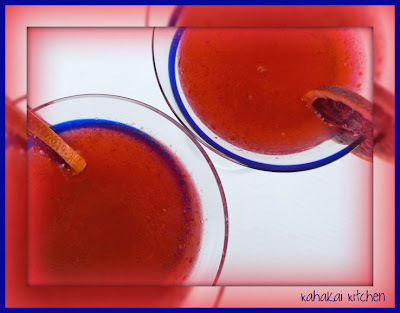 Blood Orange-Ginger Saketini: A Refreshing Cocktail & "Simple Saturday Sipper"
We haven't had a cocktail as a "Simple Saturday Sipper" in quite some time, (December actually! ), and this was a cocktail kind of week. It wasn't a bad week, in fact it was a great week for lots of reasons--just a really busy one. So to end the week, a fun alcoholic beverage was needed. 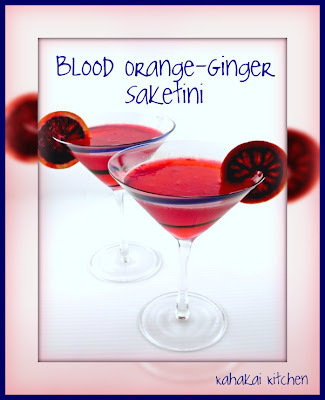 This Blood-Orange-Ginger Saketini came about when I came across some beautiful blood oranges at a newly opened gourmet grocery store by my house. Less than $2.00 for 3 of them, I knew I wanted them in a drink, but wasn't sure what I was going to make until I got home and saw a small bottle of sparkling sake. For a little extra kick, I decided to add some agave-sweetened ginger syrup that I have in my in my fridge. 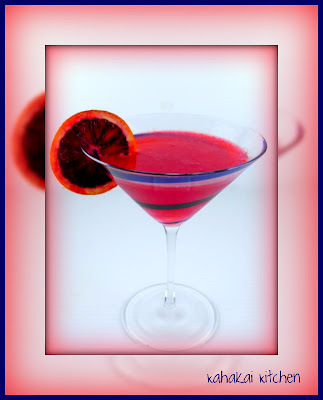 Equally divide blood orange juice and ginger syrup into two martini glasses. 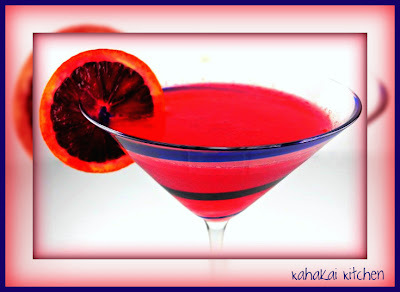 Top with sparkling sake and serve with blood orange slices as a garnish. Sip and enjoy. So what are your weekend plans? 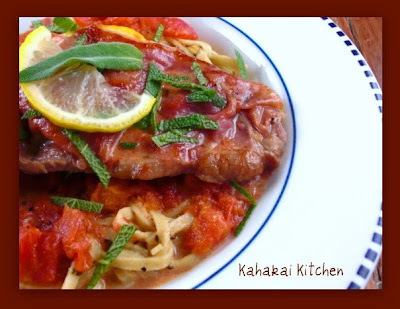 Recently the Hawaii Cattle Producers Cooperative Association (HCPCA) was at the farmer's market with some of their Hawaiian Red Veal so I bought a package of ground veal and a package of scaloppine slices (very thin slices of veal cut from the leg), to try. Veal, the meat from young calves, gets a bad rap sometimes mainly due to animal cruelty concerns based on the practices around how it is raised and produced. The typical commercial method of veal production is to take a calf from its mother and raise it to about 18-20 weeks old in a crate or small pen where its movements are very limited. The animal is fed a milk replacement, which, along with the lack of exercise, fattens the calf and produces a tender, white meat often referred to as "milk-fed veal." rough handling, the meat is tender and flavorful. Because it is a local product, it is also very fresh. The HCPCA is in the early stages of producing this seasonal product, but hopefully it will become even more widespread as it benefits both the local consumers--who get a fresh, local product that is free of hormones and antibiotics and raised in a more humane way, as well as the producers who can make a better profit selling the meat here on the islands rather than shipping their calves to mainland feed lots. Less food miles is less of a carbon footprint and better for the environment too. Several of my favorite restaurants have been serving the veal when it is available, so I was excited to cook with it myself--it's nice to cook with local proteins other than fish. 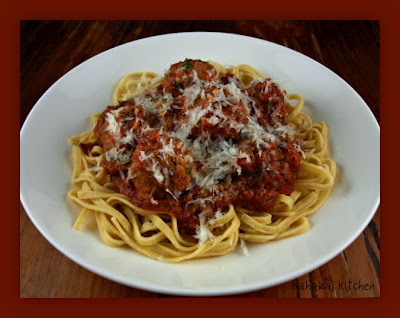 ;-) With the ground veal I decided to make an Italian Meatball recipe adapted from the veal producer's flier and serve it with some simple, flavorful marinara sauce over whole wheat pasta for a healthy dinner. 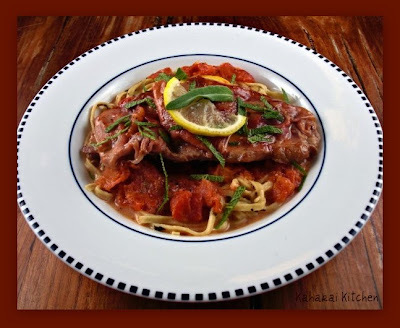 With my scaloppine slices, I chose to make my favorite veal dish, saltimbocca--a simple, delicious Italian dish made with sage and prosciutto. Tyler Florence's Saltimbocca Romano has been my go-to recipe (see it here and here), but I decided to give the Veal and Lemon Saltimbocca recipe by Giada De Laurentiis a go, just to change it up a bit. In addition to the lemon, Giada adds a tomato cream sauce to her dish which sounded rich and good. Place the bread crumbs and milk in a large bowl and soak for about 10 minutes. Add the remaining ingredients and mix together well, kneading the mixture until it is smooth. Pinch off a piece and cook it in a frying pan or in the microwave to test for seasonings. Add salt and pepper to taste if needed. With your hands, form meatballs, about 1 to 1/2 inches in diameter. Place the meatballs on a plate. Heat a large skillet over medium heat. Add a little olive oil and when it is hot, add the meatballs. Brown the meatballs, turning them in the pan. Cook the meatballs until they are well done. Remove from the pan. Serve them as appetizers or with a marinara sauce over pasta. (I cooked the meatballs on a parchment paper lined, rimmed baking sheet at 400 degrees F. for about 17 minutes, then served them over whole wheat fettuccine noodles with a tomato sauce). Heat oil in a large saucepan, add the onion and saute over medium heat until translucent, (about 5 to 10 minutes). Add the garlic and cook for 2 more minutes. Add the wine and cook on high heat until most of the liquid evaporates, about 3-4 minutes. Stir in the anchovy paste, tomato paste, tomatoes, parsley, basil, oregano, crushed red pepper, pepper and salt, reduce heat and simmer for about 20 minutes. To serve, add the cooked meatballs to the sauce, cover, and simmer on low for about 10 minutes. Serve hot on cooked spaghetti with grated Parmesan. Notes/Results: Excellent! 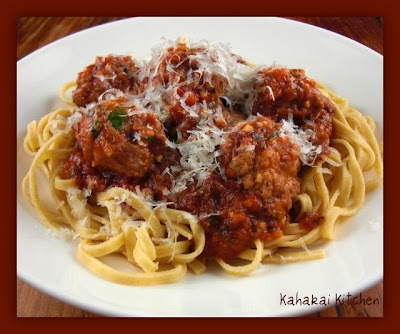 The meatballs are very moist, tender and have good flavor. I baked my meatballs instead of frying--less hassle and mess and healthier too. I threw together a simple marinara sauce, made rich and flavorful with some red wine and anchovy paste and it was great with the meatballs. Since I have cut the bulk of the dairy out of my diet, I used rice milk to soak the breadcrumbs for the meatballs and left the Parmesan cheese out of the meatballs themselves, but I did add a little finely grated cheese to garnish the dish. A little indulgence never hurts! ;-) I would make this again. The leftover meatballs and sauce are going to top a pizza with some added veggies for tomorrow's dinner. You can find this recipe at the Food Network site here. Place the veal chops on a work surface and season with salt and pepper. Place a slice of lemon on top of each chop. Top with 1 leaf of sage. Lay a large piece of prosciutto on each chop and press to seal. Warm the olive oil in a large skillet over medium-high heat. Place the veal chops in the hot oil, lemon side down. Saute until the prosciutto starts to caramelize, about 2 minutes. Turn the veal over and saute for another 2 minutes. Remove to a platter and set aside. Deglaze the pan with the white wine, scraping up the brown bits from the bottom of the pan with a wooden spoon. Add the chicken broth and reduce by half. Add the tomatoes, cream, salt, and pepper. Stir until combined and hot. Pour the sauce over the veal and top with the remaining 1 teaspoon finely chopped sage. Serve immediately. Notes/Results: Delicious! 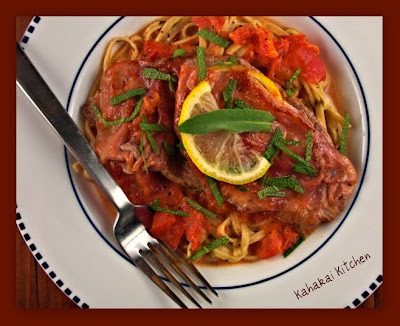 A different saltimbocca than I am used to, and the simpler Tyler recipe remains my favorite, but this one was really good with the added lemon and the tomato cream sauce and was still very quick and easy to make. The prosciutto makes a little packet with the thin lemon slices and sage tucked inside, and I was pleasantly surprised by how well it stayed together during the cooking and flipping over. Instead of cream (again the dairy), I used soy creamer, which has less saturated fat and calories than cream and worked fine in the sauce. My sage leaves were not very big, and my veal pieces long and narrow, so I used a couple of the leaves and two slices of lemon on each piece of veal. I served the veal with some of the leftover whole wheat pasta, reheated with some olive oil, a bit of broth, garlic and some dried parsley, basil and oregano, Although I would be inclined to make Tyler's recipe more often, this recipe tasted great and I would make it again. A fun local product to try in a couple of classic Italian dishes.